Devondale has launched Matilda’s Dairy Dash in a bid to combat the pressure of discounting from private label brands and to drive loyalty among mums. Created by Oxygen Interactive, the campaign fronted by Matilda, the Devondale Cow, uses mobile gaming, a consumer promotion and a printing technology new to Australia whereby unique codes are only revealed on packs once they’re chilled. Matilda’s Dairy Dash, available on IOS, Android and Facebook, leverages the popularity of games like Candy Crush and incentivises and rewards consumers who purchase Devondale Long Life and chilled milk with the chance of instantly winning a share of $100,000. Consumers can play the game for free, however to play for a share of the prize pool, they need a unique code that’s found on pack. In addition, players are encouraged with bonus prizes tokens to socially share their game successes such as level completions and prize wins. Devondale will also use the game to communicate its brand story and the product range as well as its status as a co-operative and an Australian owned company, which it believes will resonate highly with its target market. 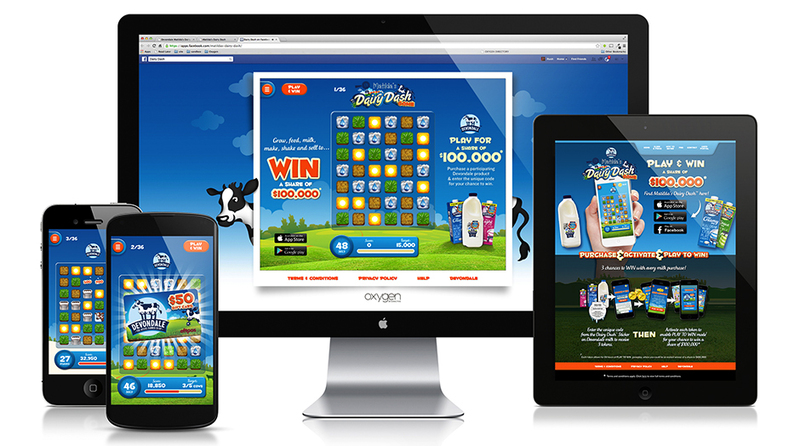 Oxygen Interactive strategy director, Iain Crittenden, said they took a unique approach, “The really nice thing about this campaign is it takes everything that’s great about loyalty and promotions and technology and wraps the whole experience up in a fun, engaging and addictive mobile game. The game has launched with an iOS version through the App Store, an Android version available through Google play and a Facebook version on the Devondale Facebook page. All three can be accessed via dairydash.com.au. Devondale Long Life and chilled milk featuring the promotional stickers will appear in-store over the coming weeks.